Healthcare: We advocated for the administration to continue TennCare’s federal/state partnership with its two-to-one match rather than promote/support a move to block grants or per-capita caps. Home and Community Based Long Term Services and Supports (HCBS LTSS): We advocated for administration to include funding for a minimum 1,200 new slots in the ECF (Employment and Community First) Choices waiver for the fiscal year 2020-2021. Direct Support Professionals: We advocated for the administration to make all the funds appropriated for DSP wages recurring funds. Employment: We advocated for the administration to continue the Employment First Task Force and to become a leader in employing people with disabilities in Ssate government. Education: We advocated for the administration to support the current Division of Special Population’s work of creating inclusive education environments for students with IDD, providing the high-quality training for its educators, and creating strong transition programs that prepare students for life after high school. Affordable and Accessible Housing: We advocated for the administration to leverage federal funds and public-private partnerships to expand the creation of more affordable housing option for this population. Transportation: We advocated for the administration to think about the needs of people with IDD as they explore transportation issues across the state. Katie Beckett Waiver HB 1050 SB 0464: This would be a waiver for children who have long-term disabilities or complex medical needs and live at home. It allows children to receive services at home with additional supports, instead of in a health care facility or institutional setting. Under TEFRA/ Katie Beckett, only the child’s income and resources are considered (not those of the parents) when determining an individual’s eligibility for services. After all of the appointments were over, the team leaders made sure that all members of their team were present and ready to go. The trip was very successful again this year. Many of the participants reported having a great time and the representatives expressed their appreciation for meeting with us and for the time we put into advocating for the various issues. 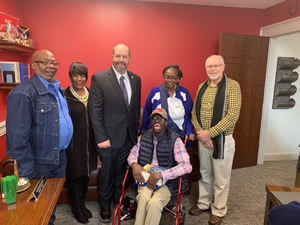 Left to Right: Ronald Bynum, Regian B. Williams, Rep. Chris Todd, Rita Dortch, John Hiatt and seated Kody D.
Standing: left to right Kenneth L., Rep. Kirk Haston, Robyn E., Kyona H. and Dionte M.
The Supported Decision Making Agreement Act (SB 264/HB 941) would define “least restrictive alternatives to conservatorship” as processes that let people with disabilities maintain as many decision-making rights as possible. The goal is to maximize their independence while minimizing the risk of abuse or neglect. 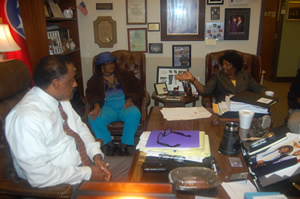 Support the Aging Caregiver legislation (HB 1542/SB 1494) would amend a 2016 law to let people with developmental disabilities enroll in the Employment and Community First (ECF) CHOICES program to get a Self-Determination Waiver if they have custodial parents or caregivers age 75 and older. The statute now only covers individuals with intellectual disabilities. 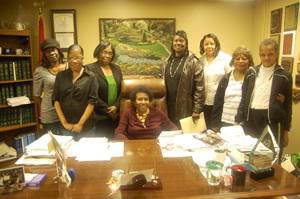 Hawkins divided The Arc Mid-South’s lobbyists into five groups, who met with about 30 state lawmakers in all. “They made a good impression,” she said. 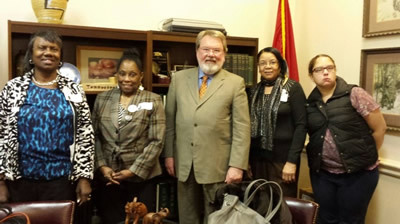 On February 8, members of The Arc Mid-South attended Disability Day on the Hill in Nashville. 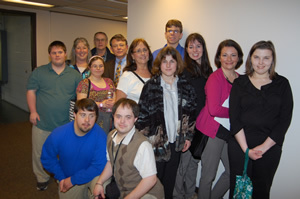 This is an annual event where self-advocates, family members, and organizations from all over Tennessee meet with legislators to discuss issues that are important to people with disabilities. Some issues that were discussed included Medicaid block grants, pay for DSPs, allowing DSPs to dispense medication to patients, and the Affordable Care Act. There also was a mid-morning briefing sponsored by the Tennessee Council on Developmental Disabilities. 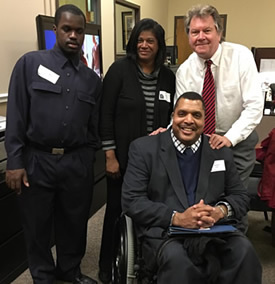 On January 27, 2016, The Arc Mid-South had the opportunity to attend Disability Day on the Hill in Nashville, Tennessee. 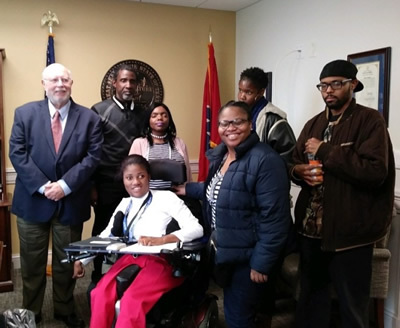 Disability Day on the Hill is an annual event where self-advocates, family members, and organizations all over the state of Tennessee gather in Nashville and meet with legislators to discuss issues that are important to people with disabilities. Some of the issues that were discussed include (but are not limited to): the DIDD waiting list, the creation of a waiver for people with developmental disabilities, employment as a first resort for people with disabilities, and healthcare for all Tennesseans. 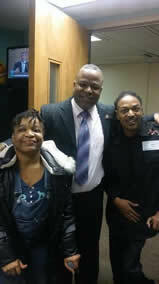 There was also a mid-morning briefing sponsored by the Tennessee Council on Developmental Disabilities. 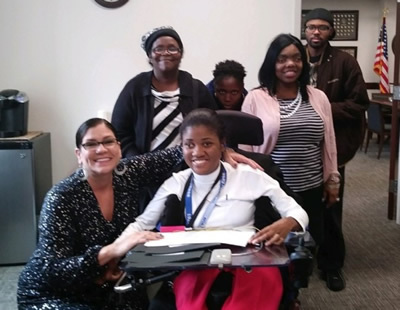 Our own Brittany Carter discussed the importance of self-advocacy in determining public policy! 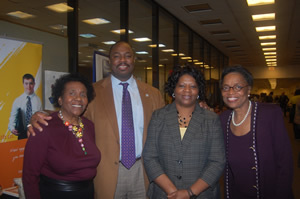 We had a great time meeting with our legislators this year and look forward to next year! Please checkout this video link https://youtu.be/AuK5uvza5f8. 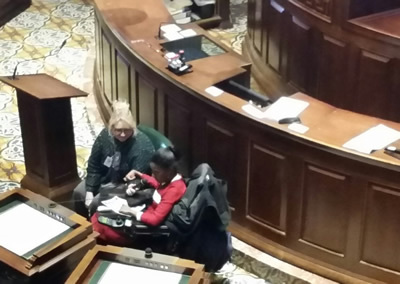 One of The Arc Mid-South staff Brittany Carter's presentation at Disability Days on The Hill. 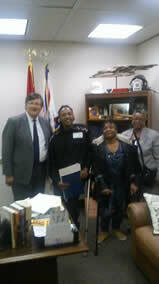 The Arc Mid-South traveled to the capital in Nashville on January 30th, 2013 for Disability Days on the Hill! 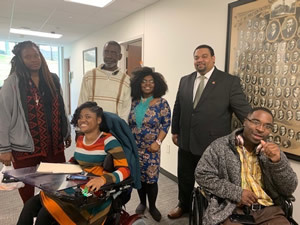 Sixty-two concerned citizens met with state legislators to talk about issues that are important to individuals in our community living with disabilities. 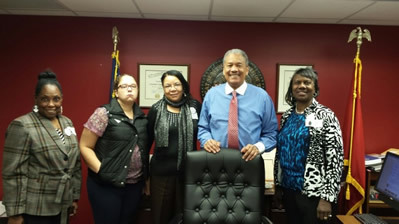 Issues discussed include the Department of Developmental Disabilities' waiting list for waiver services, family support, and Medicaid expansion. 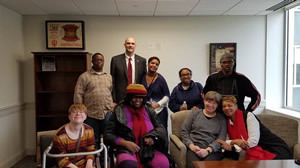 We were fortunate to have met personally with approximately 21 legislators and also had an opportunity to briefly meet numerous others in the hallways as they moved between meetings. 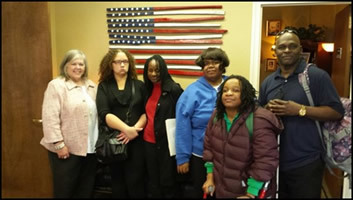 In each meeting staff from The Arc Mid-South, the University of Memphis, individuals with disabilities and their family members, and people from the community expressed the need for services for individuals with disabilities. 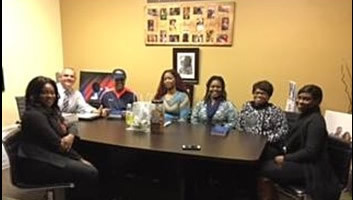 The highlight of each meeting was the opportunity for the families to share their personal stories so that the legislators could associate a face and name with the funds that are so desperately need. One mother said, "Our main reason for going was to voice our opinion on the Family Support Programs for people with disabilities and how important this is for the family."